This is another of those amazingly simple dishes that is delicious, nutritious and satisfying. This is a Thai take on Hainanese Chicken Rice, versions of which are found all over South-East Asia. The combination of the delicious rice and chicken and the piquancy of the chilli-ginger sauce is a real winner. Combine the ingredients in a blender and pulse until smooth but not puréed. Set aside. 1 x 1.5Kg whole free range corn fed chicken, skin on, any excess fat removed. To make the chicken and rice, rub the chicken with the salt. Place the spring onions and 2 pieces of ginger in the cavity. Place the chicken in a large saucepan, add the stock and bring to a boil. Simmer, uncovered skimming off any foam, until the chicken is cooked through, 40 to 45 minutes. Remove from the heat. Transfer the chicken to a platter and allow to cool slightly. Discard the spring onions and ginger from the cavity of the bird and remove and discard the skin. Remove the breast meat, legs and wings. Discard the carcass. Slice the breast meat and separate the drumstick from the thigh. Return the meat to the platter and keep warm. Measure 4 cups of the stock the chicken cooked in, retaining the rest for another use. In large saucepan, heat the oils over medium-high heat and add the garlic and remaining ginger slices. Cook stirring for 2 minutes. Add the rinsed rice and toss until coated. Add the 4 cups of stock and bring to a boil. Simmer, covered until the liquid is absorbed and the rice is tender about 15 minutes. Transfer the rice to a serving platter. 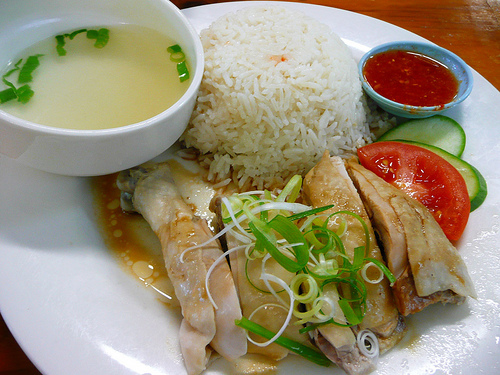 Top with the chicken, garnish with the spring onions and serve immediately with the chili-ginger sauce on the side. Dedicated to my Thai food guru Wan and my bestie Conrad, who loves this dish and surpasses all human tolerance of chilli consumption.